The ‘Archifooon’ or ‘Archiphone’. Anton De Beer & Herman van der Horst. The Netherlands, 1970. 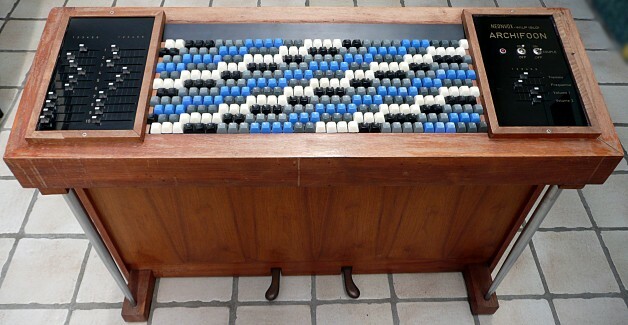 The Archiphone was essentially a portable electronic version of the giant ‘Fokker Organ’ – a thirty one tone microtonal pipe organ designed by the Dutch Physicist Adriaan Fokker in 1950. 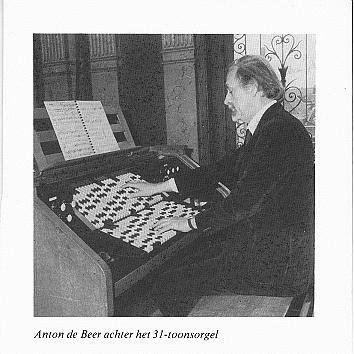 The new electronic instrument was designed and built by Herman van der Horst of the firm Neonvox (based in Wilp, Gelderland, Netherlands) at the request of the organist, microtonal composer and Fokker-Organ virtuoso, Anton De Beer. Only four finished versions of the instrument are known to have been built they are located at: (1&2) Huygens-Fokker Foundation, Amsterdam NL (3) William Bromhead Coates, 140 Station Street Blackheath NSW 2785 Australia, (4) Webster College St. Louis, Missouri, USA. The unique aspect of the Archiphone was it’s microtonal keyboard design. 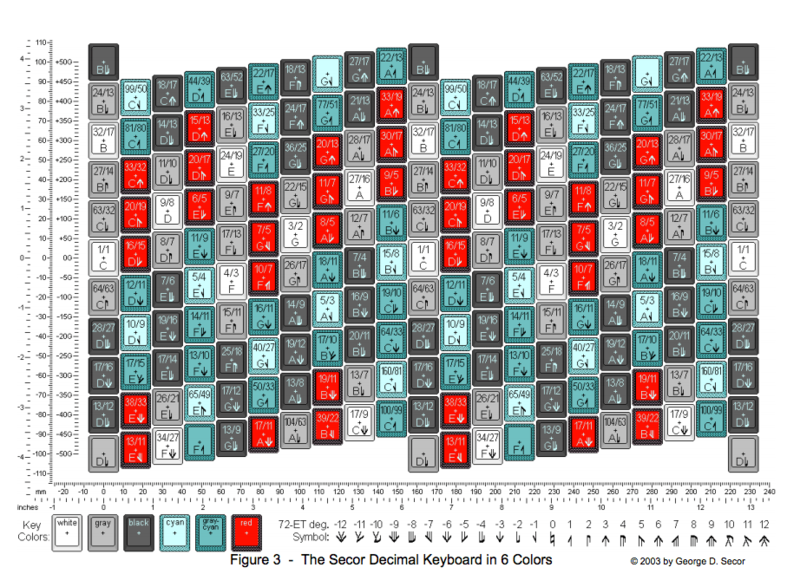 The instrument was played on an unusual five octave, 333 note black (sharps), white (naturals), blue (semi-sharps), dark grey (flats) and grey(semi-flats) keyboard based on Huygens’s microtonal scale of 5th-tones (Christiaan Huygens, who, in 1661 rejected well-tempered tuning and first posited the 31-tone system). 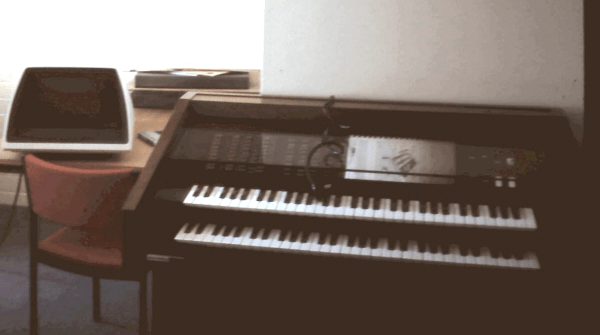 The sound was generated by transistor oscillators mount on removable printed circuit boards and controlled in the usual organ stop method; combinable Pipe Organ, Piano, Woodwind, Flute, Trumpet, Strings and a series of mixable filters, vibrato and Bass/Treble settings controlled by manual sliders. The Archiphone was housed in a 116 × 40 × 15 cm wooden lacquered box, Which, with an external 50 watt amplifier and speaker boxes allowed a certain amount of portability. 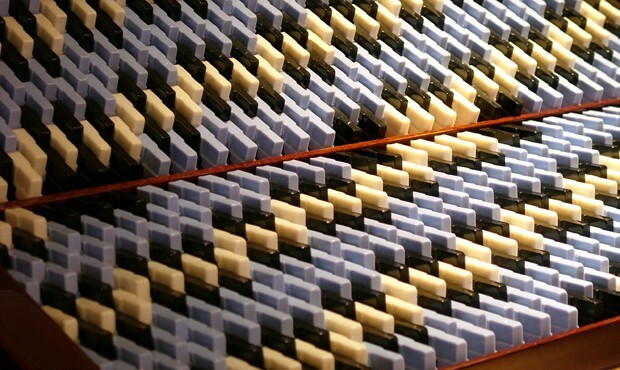 A number of microtonal compositions have been written for the archiphone by artists such as Adriaan Fokker, Henk Badings, Anton de Beer, and Joel Mandelbaum. An instruction manual was written by Anton de Beer: ‘Guide for the use of the Archiphone’ (1976). Adriaan Fokker, cousin of the famous aviation pioneer Anthony Fokker, was educated in the Netherlands initially as a mining engineer at the Delft University of Technology, and later as a physicist at Leiden University. In Leiden he earned his doctorate in 1913. Fokker’s name is best known for the Fokker-Planck equation– a partial differential equation of second order, which describes the time evolution of the probability distribution of a physical variable subjected to a stochastic force, in addition to friction and possibly other driving forces (a prototypical example being Brownian motion). 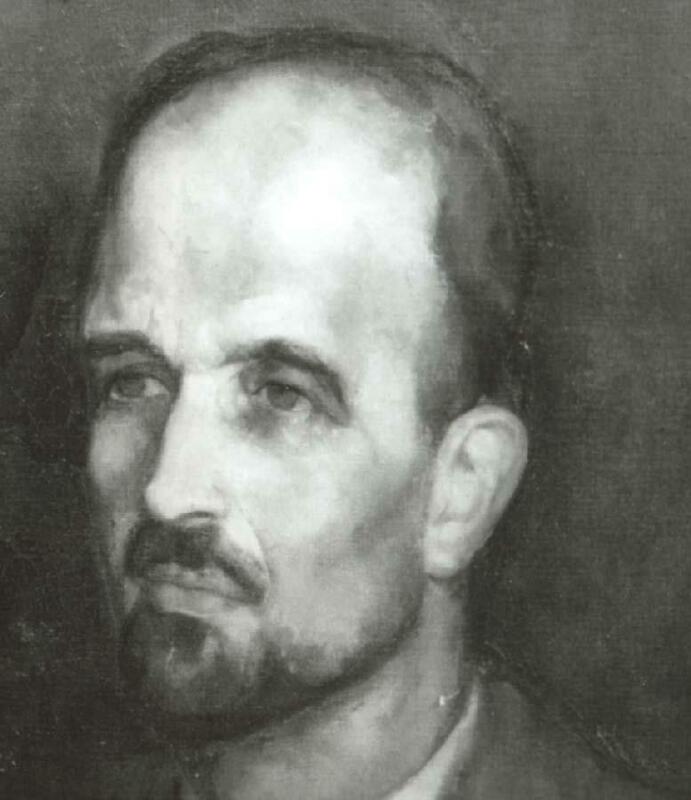 The Fokker-Planck equation was contained in Fokker’s thesis, and was independently derived by Max Planck. During 1913-14 Fokker worked in Zürich as Albert Einstein’s assistant, and published an article in general relativity with Einstein as co-author. In 1923 Fokker was appointed professor of physics at Delft University of Technology. In 1940 The Netherlands was invaded by the German Army. 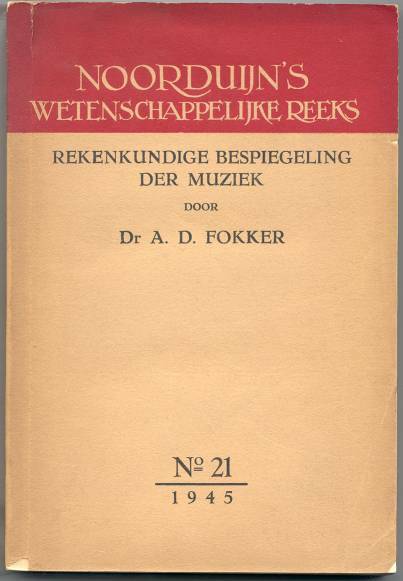 To avoid having his skills as a physicist being used by the occupying Germans, Fokker turned to music theory – and in particular, tuning practice, microtonality and issues related to just intonation and the compromises embodied in equal temperament. His chief interests were the theories of Euler and Huygens. During the war, he constructed and had built a 12-key pipe organ with mean-tone tuning according to the principles of Euler’s ‘Generibus musicis’. Later, he had a 31-key organ built that realised an approximate pure tuned scale, based on Huygens’s microtonal scale of 5th-tones. Concerts involving the Fokker organ were given regularly since 1951. 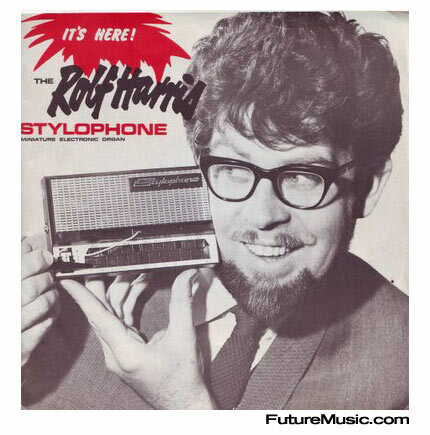 At the end of his life, an electronic version, the ‘Archiphone’ was produced in 1970. Anton De Beer playing the original Fokker Pipe Organ, Haarlem, NL. Leave a comment on The ‘Archifooon’ or ‘Archiphone’. Anton De Beer & Herman van der Horst. The Netherlands, 1970. Since the 1960s, Australian electronics engineer Tony Furse had been trying to develop an electronic musical instrument that was capable of digitally synthesising complex waveforms such as percussion and orchestral instruments. Furse’s early transistor prototypes using small flip-flop circuits only became practically viable with the advent of of integrated circuits in the late 1960s – this basic ‘proto digital waveform generator’ (1966 to 1969) enabled him to control waveform harmonics but failed to deliver the tonal complexities of ‘real’ instruments. In 1972 Furse set up his own company ‘Creative Strategies’ in Sydney, Australia to continue the development of his instrument. The first product of Creative Strategies was named the Qasar I a monophonic digital/analog hybrid synthesiser. Despite only two prototypes being built, the instrument attracted the attention of electronic music composer Don Banks (then Head of Composition and Electronic Music Studies at the Canberra School of Music) who had worked at the EMS studio in London. 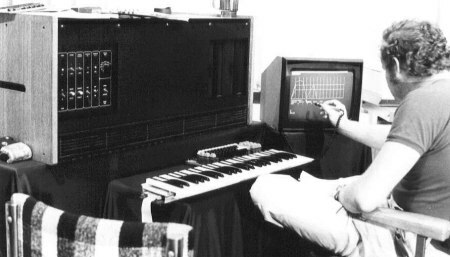 Don persuaded Canberra School of Music and the Federal government to fund the development of the Qasar and also contributed his knowledge and experience of using EMS electronic instruments – such as the VCS3 – to the project. The result of this collaboration was the Qasar II, a duo-phonic digital instrument based on dual 8-bit Motorola 6800 microprocessors in an unusual parallel configuration. 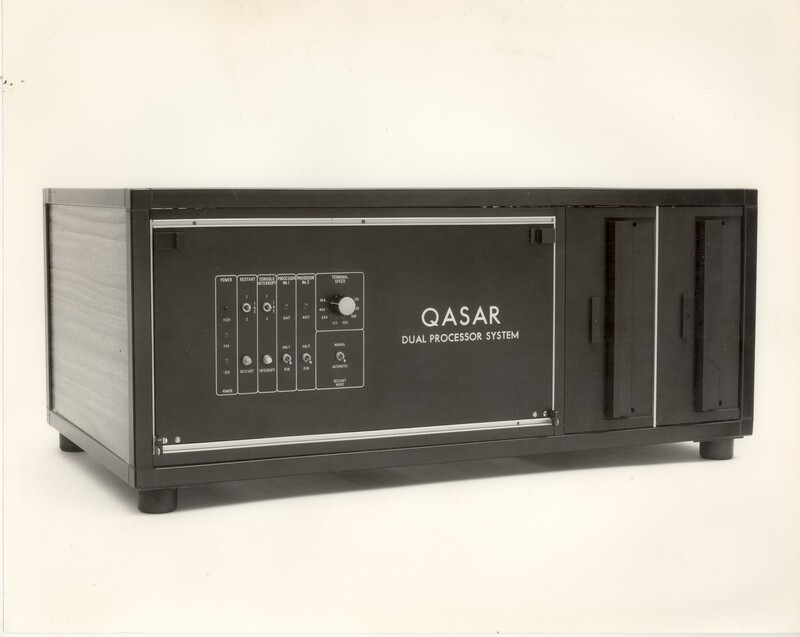 The Qasar II was capable of digitally synthesising waveforms but couldn’t output harmonic partials so the sounds that it produced were fairly static. 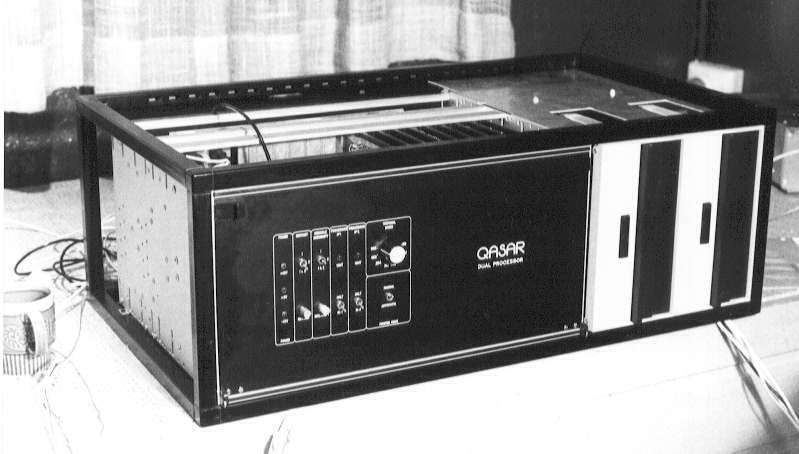 The expensive microprocessor based Qasar II failed to go into production being unable to compete with the much cheaper transistor based Moog Modular, released around the same time. Furse and Creative Strategies next project was the Qasar M8 or “Multimode 8”. Completed in 1975, the M8 was a $15,000, 8Bit, 4k memory, 8 voice polyphonic Digital Synthesiser based around the same dual 6800 1mhz Motorola processor and wire-wrapped board combination as the Qasar II. Uniquely the M8 allowed the synthesis of sounds using additive Fast Fourier Synthesis (FFT) drawn and edited with a light pen on a black and white VDU. The instrument was housed in a large box and played manually via a four octave keyboard or digitally using Furse’s innovative MUSEQ 8 ‘sequence playing system’ . 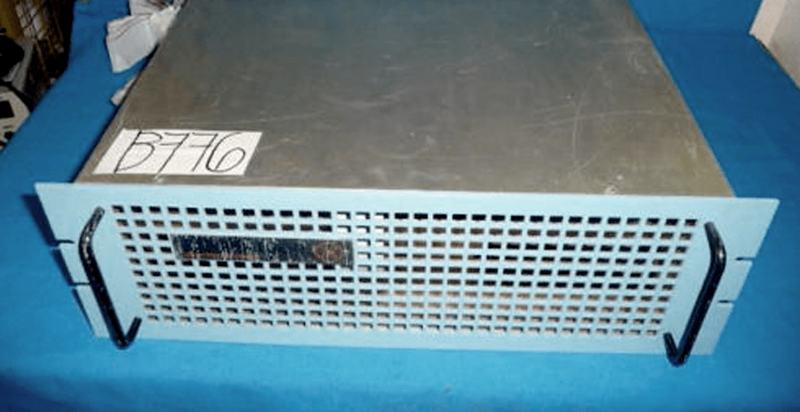 Sound programmes could be saved to an 8″ floppy drive. 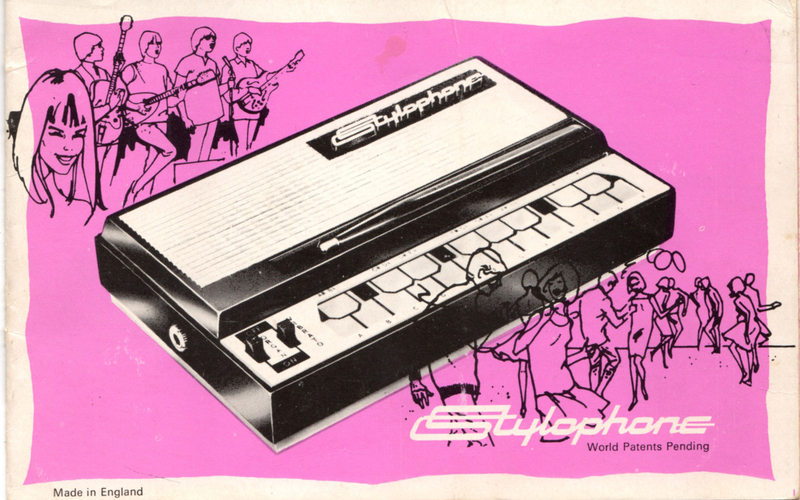 Later Models included the 8-voice MC6800 and Qasar Polyphone (1975). 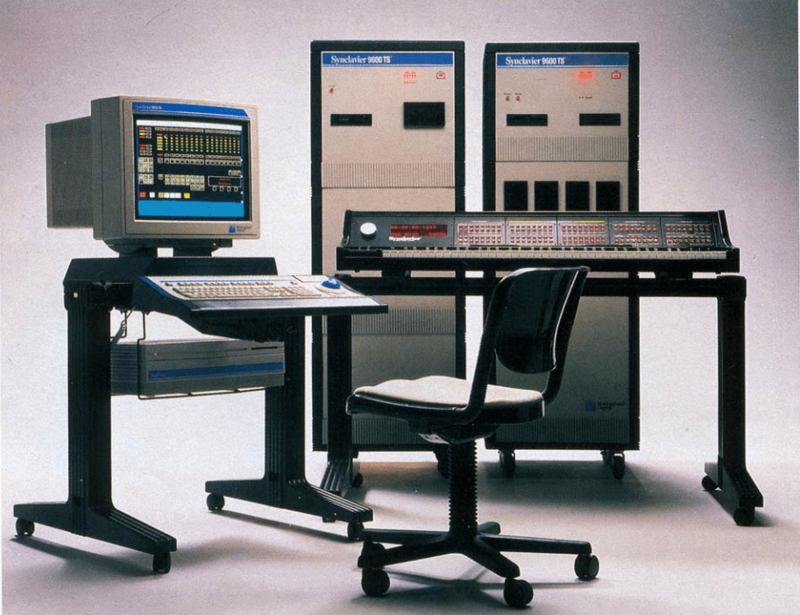 In 1976 fellow Australian electronic instrument designers, Kim Ryrie and Peter Vogel, approached Furse with an offer to license the M8 to their Fairlight company. 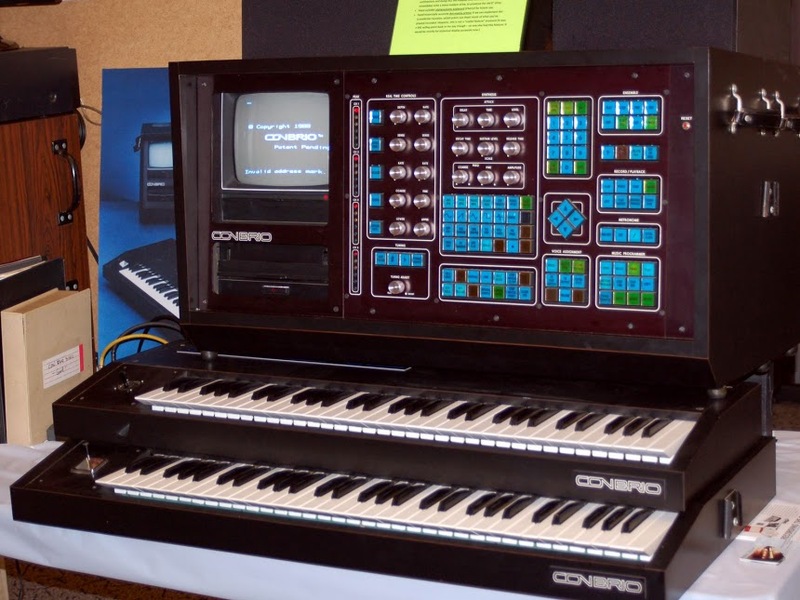 This became Fairlight’s first production instrument the Qasar M8 CMI and the direct ancestor of the famous Fairlight CMI. The M8 CMI was an even more expensive $20,000 redesigned version of the dual CPU 6800 processor but with printed circuit boards, a new QDOS OS ( based on Motorola DOS), 8 voice polyphony all controlled by a more dynamic six octave keyboard and the same light pen control as the earlier M8. The large and expensive Qasar M8 CMI was eventually discontinued in 1979, many of the features of the M8 being incorporated into the Fairlight CMI digital synthesiser/sampler. Born in Sydney in 1938 Tony Furse was passionate about electronics from an early age. His interest in all things technologicalled to him using the electronics and communications equipment available from army disposal stores in the post World War IIperiod to create his own inventions which ranged from crystal sets to high voltage generators.In the late 1950s, Furse’s interest in creating electronic music had resulted in his earliest invention, an electronic clarinet.This clarinet, which could be played with one hand, was made by converting a secondhand clarinet into a working electronicinstrument powered by a car battery. Played using a keyboard-like attachment, electric solenoids were used to cover and uncover the holes. Curious about the nature of harmonics, Furse began looking at the different sounds produced by electronic organs (which used signals produced by radio valves). He wondered why, among the range of sounds available, there was no option to produce percussive or string sounds. His subsequent research included reading an English translation of the work by German physician and physicist Hermann Helmholtz, ‘On the Sensations of Tone as a Physiological Basis for the Theory of Music’ ,which talked of the two extremes of sound, from noise at one end to musical tones at the other. Also inspiring for Furse at the time were the American accoustical engineering pioneer Harry F. Olson’s ‘Elements of Acoustical Engineering’ (1957) andAmerican musicologist, Charles A. Culver’s book, ‘Musical Acoustics’ (1956). While Furse spent the 1960s and the early ’70s working as an electronics engineer in the computer industry, in his spare time he was still applying his technical skills to the creation of electronic music. A major breakthrough came for Furse when in 1964 he read an article written by James, Potok and Oxley titled ‘Repetitive Function Synthesizer and Spectrum Display’. 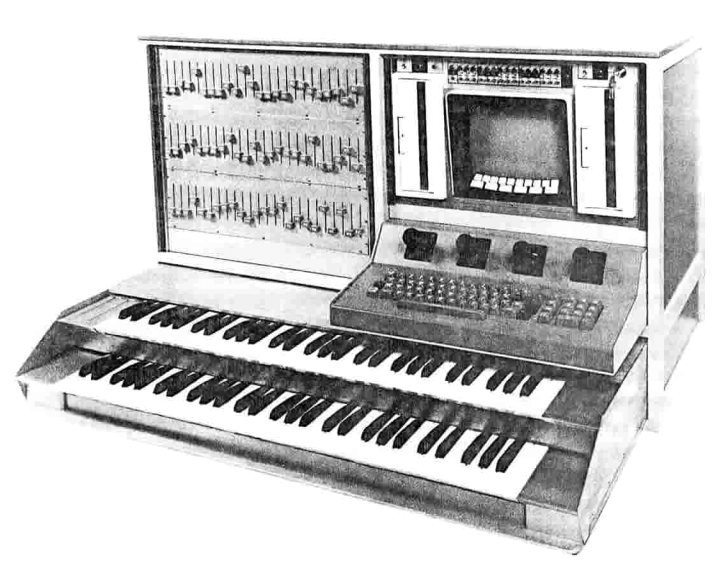 The article, which mentioned ‘digital sampling’ and a device that made this possible, enabled Furse to develop the first ‘all digital waveform synthesiser’.His attempts in the early 1960s to build the equivalent of today’s microcomputers had involved using too many transistors to make it a viable concern – it was only in the mid 1960s, when the appearance of integrated circuits, (capable of holding increasingly large numbers of transistors within a chip) made his research more affordable, that Furse’s research took off. 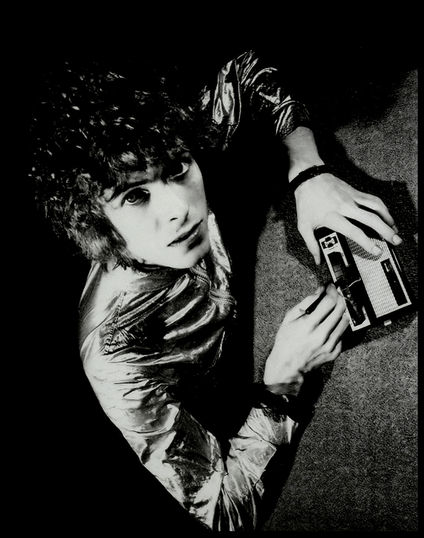 But although the ‘proto digital waveform generator’ that Furse had invented and used from 1966 to 1969 allowed him control over harmonics, the sound produced still fell short of his idea of a realistic reproduction of actual instruments. Leaving his job in early 1972 to concentrate on further developing his inventions, Furse set up his own company, Creative Strategies Pty Ltd, which he operated from his home in Sydney’s Neutral Bay. 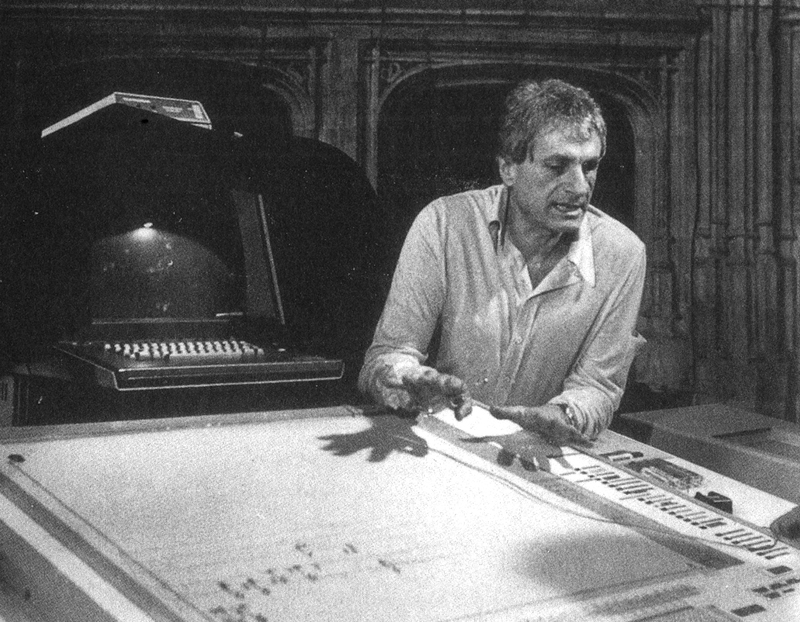 His first invention was an ‘analogue/digital hybrid synthesiser’ which he named Qasar 1. 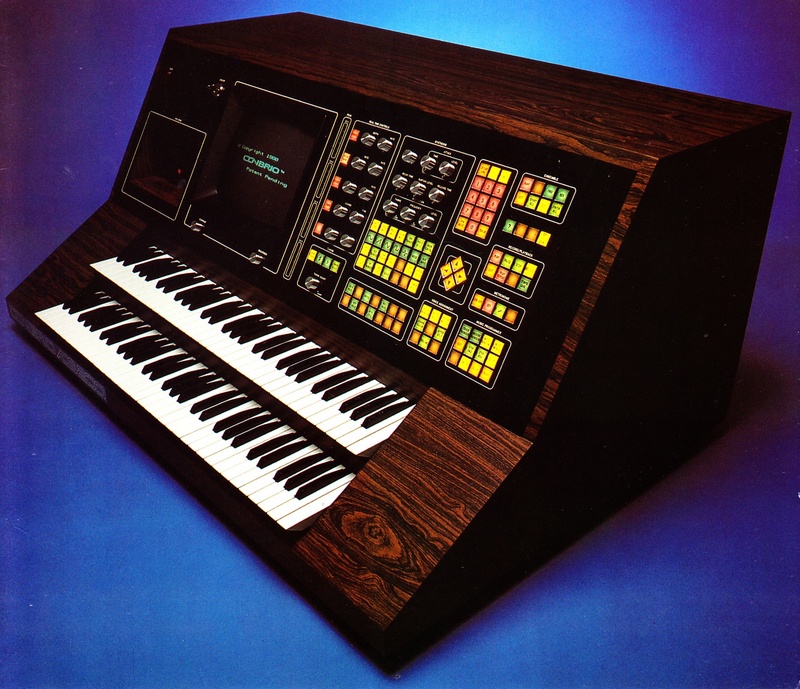 As well as breaking new ground in its design, another attractive feature of the synthesiser was its affordability. To market this invention, Furse enlisted the help of David Bross, a computer salesman and talented keyboard player, who, after quickly mastering the Qasar 1 synthesiser, joined Creative Strategies as a company director. Another person instrumental in providing support for Furse at this time was Don Banks, the noted composer of jazz, classical music and electronic music who, following a number of years studying and working in England, had returned to Australia in1972. The following year he was appointed head of composition studies at the Canberra School of Music, setting up the School’s electronic music studio. 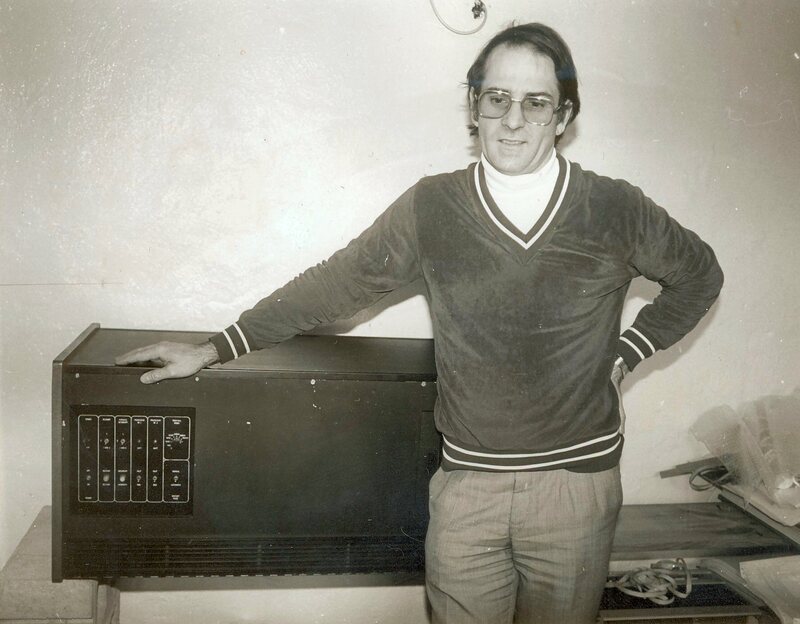 He took an interest in Tony Furse’s next invention, a ‘digital/analogue hybrid sound synthesiser’ named the Qasar II, operated by a keyboard control panel, which had been developed with the assistance of a grant from the Australian Council for the Arts -Banks purchased the Qasar II for the School of Music. 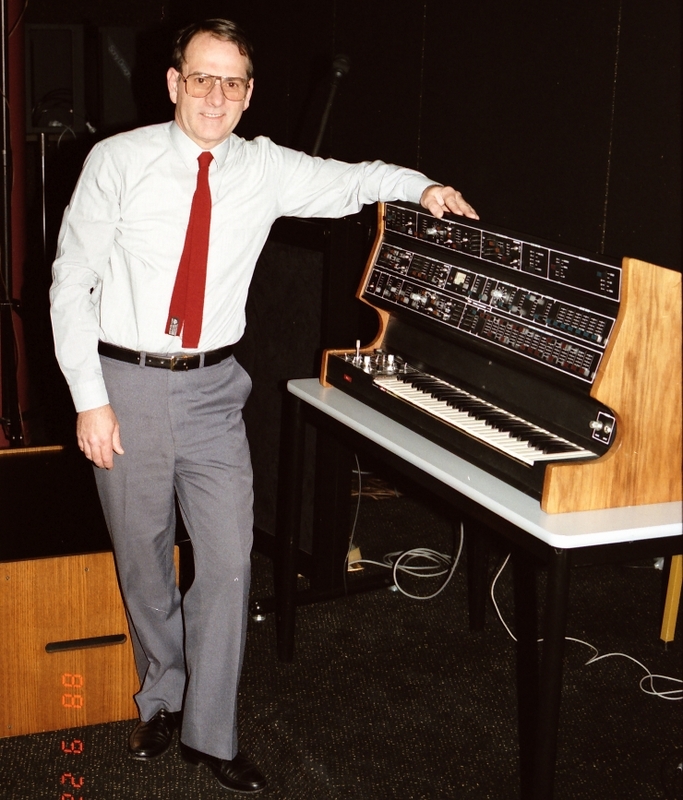 Furse’s next project was an all-digital synthesiser, which he named the Qasar M8 (Multimode 8) synthesiser. In addition to a keyboard, Furse had developed a graphics display which, with the use of a light pen, allowed the operator to create an instrument or voice using waveforms. After having made a deal with the large American electronics company, Motorola to use their programme development system, Furse was able to develop the MUSEQ 8 sequence playing system. The idea was that the MUSEQ 8 system, when used in conjunction with his M8, could be used by composers of all kinds of music, not just electronic, for the composition and the performance of music. 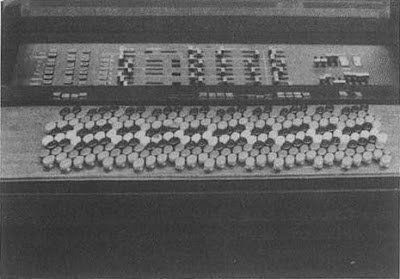 Another major innovation with the M8 synthesiser was Furse’s use of two 8-bit Motorola 6800 microprocessors in an unusual parallel configuration which greatly speeded up data input and output. 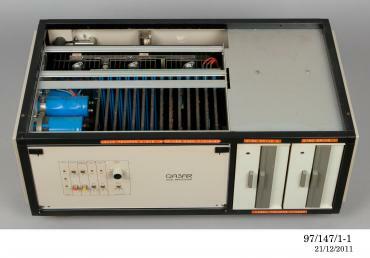 In late 1974, following the success of Furse’s lecture and demonstration of the Qasar M8 in Canberra before an audience from the Canberra School of Music, the Australian National University and the College of Advanced Education, Don Banks, who realised the potential of Furse’s invention for the School of Music, requested a similar model be made for the School’s electronic music studio. Furse continued to work on the prototype making use of the latest technology by incorporating floppy disk storage using the newly released 8 inch floppy disks The disks worked differently from tape recorded music in that apiece of music could be reorchestrated without altering the data on the disk.In mid 1976, Furse ended up selling the prototype to the Canberra School of Music. He continued to write software for the M8,making several trips to Canberra for this purpose, also incorporating software written by software expert Bruce Williams. It had also been around this time that Furse came into contact with synthesiser enthusiast Kim Ryrie (who in 1971 had created a magazine called Electronics Today International, ETI), and his business partner, electronics designer Peter Vogel.They had also been trying to design a synthesiser which could reproduce natural and acoustic sounds as well as musical instruments. To this end Ryrie and Vogel had formed a company in December 1975 which was named Fairlight Instruments after the Fairlight ferry that crossed the harbour in front of the basement workshop of Ryrie’s grandmother where they had been carrying out their early experimental work. Impressed with Furse’s digital synthesiser (to date they had only been able to develop an analogue synthesiser which didn’t produce the results they were after) they approached him with a deal for manufacturing the synthesisers and marketing the computer as a separate entity. 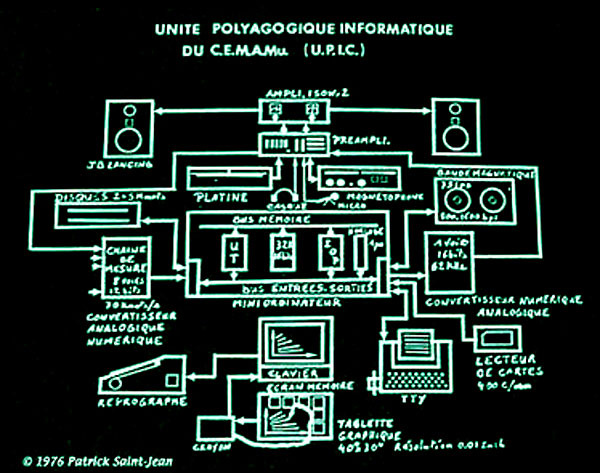 From 1976 Furse worked with Fairlight on the project, which included producing circuit boards from the circuit board schematics and reconfiguring the synthesiser’s keyboard resulting in the production of a totally redesigned version of the synthesiser which was known initially as the M8 CMI (Multimode 8 Computer Musical Instrument). In early 1979 Tony Furse, with less involvement in the project, signed a licence agreement with Fairlight, allowing them the use of his intellectual property for both the synthesiser and the computer. 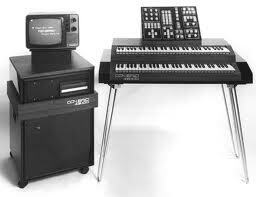 The Fairlight CMI, which included a 73 note keyboard, two 8 inch floppy disk players, a monitor and light pen used four Motorola microprocessors and was able to perform 8 different sounds at once. 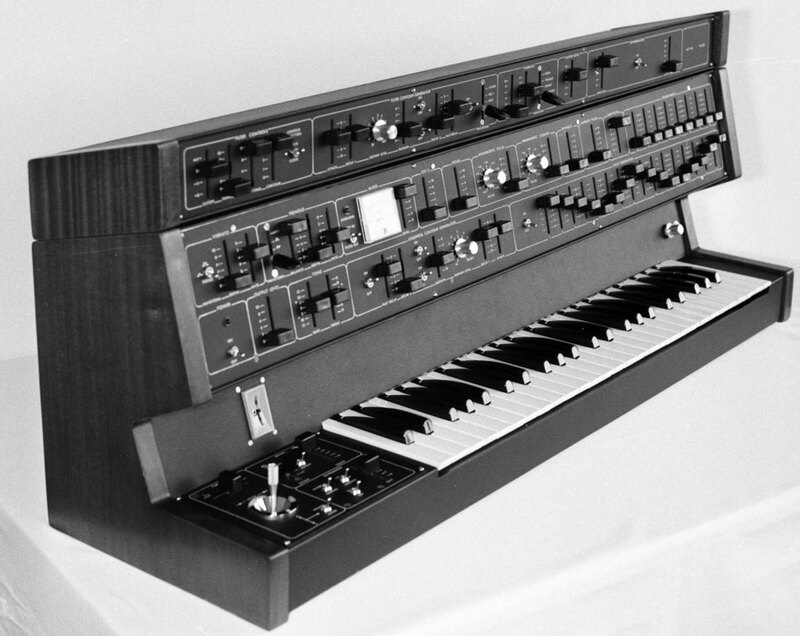 Released onto the world market in 1979 the ‘Fairlight’ synthesiser, which was capable of playing any sound at all, was an instant hit with composers and recording artists, among them Stevie Wonder, Peter Gabriel, Paul McCartney, Jean Michel Jarre, Kraftwerk and Herbert von Karajan of the Berlin Philharmonic Orchestra. 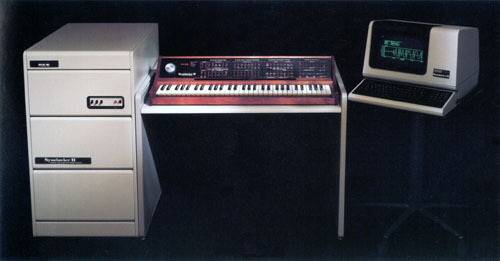 Thus Furse’s technology for the Qasar M8 formed the basis of what was to become known as the Fairlight CMI (ComputerMusical Instrument). In 1987 he was awarded the CSIRO’s Medal for Research Achievement for the invention of CMI technology. 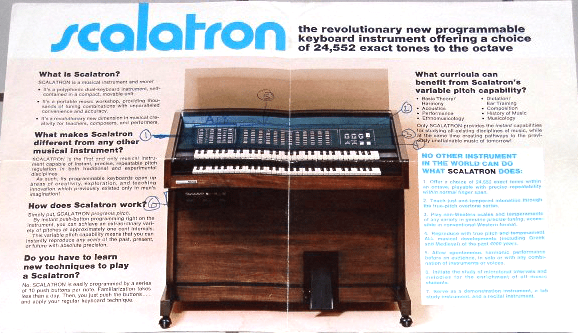 The Scalatron was an unusual microtonal electronic instrument developed in the early 1970s by Motorola as a new venture into the instrument market. 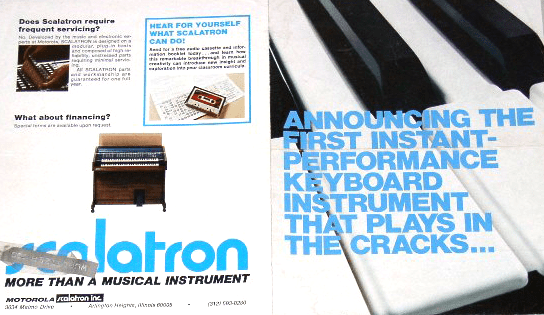 Promoted as the ‘first instant-performance instrument that plays in the cracks’ the Scalatron was aimed squarely at a more experimental, microtonal market – if such a market existed. The instrument itself was a rather basic synthesiser consisting of 240 square wave oscillators (one for each key) built into a wooden home-organ casing. Costing around $6000-$10,000, the Scalatron was an expensive and unusual instrument. Less than 20 Scalatrons were ever made (including only 2 Secor versions). 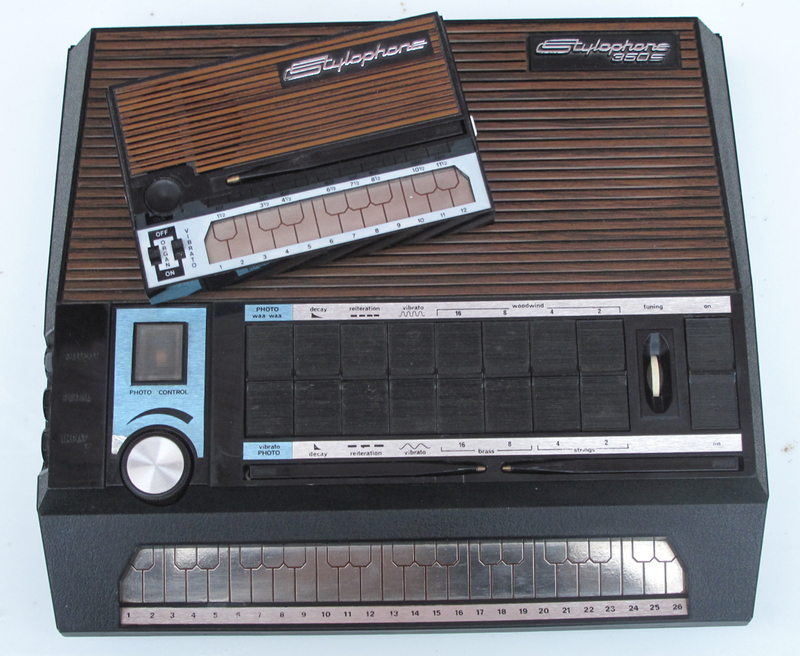 The Scalatron came with a black and white monitor to adjust each key’s pitch (using Motorola’s TV tuning technology) – a split screen showed horizontal bars representing true pitch on the left side and the instruments variable pitch on the right side, and, for an additional $1000 a cassette interface was added with a number of tuning ‘programmes’. 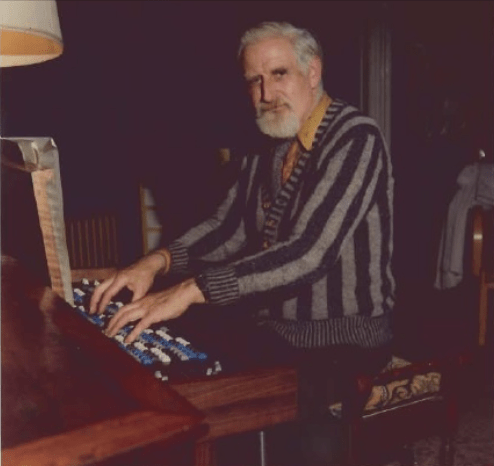 George Secor toured with the instrument playing works by Harry Partch (who also used the instrument towards the end of his life) and Ben Johnston. The Scalatron is still much in favour – though very hard to find – by microtonal composers and was used on several albums by Jon Hassell, most notably ‘Vernal Equinox’. The Con Brio ADS 100 & 200 has become something of a legendary instrument due to it’s phenomenal price – USD$30,000 or about GBP£17,000 in 1980 – and it’s futuristic sci-fi looks. 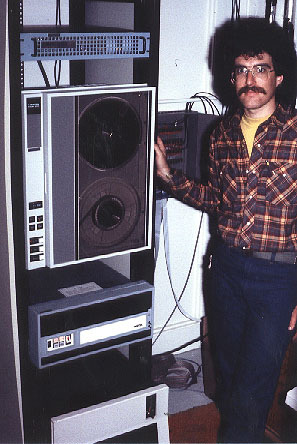 The instrument was designed by three California Institute of Technology students – Tim Ryan, Alan Danziger, and Don Lieberman in 1979, and was one of the earliest digital synthesisers. The first version – originally designed to test audio perception in their university research – evolved into the ADS100 and was capable of several types of synthesis modes via it’s 64 oscillators; additive synthesis, phase modulation (Used later in the Casio CZ series. ), and frequency modulation (FM synthesis – which brought Con Brio into conflict with Yamaha, owner of Chowning’s FM patent). Despite it’s high price and negligible sales, the ADS 100 did claim some fame when it was later used to generate sound effects for Star Trek: The Motion Picture and Star Trek II: The Wrath of Khan. 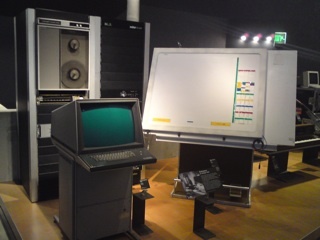 The ADS100 was based on 3 MOS 6502 processors (also used in Apple I, II and Commodore 64 computers at the time) and could display sequence patterns and waveform envelopes on a video display. 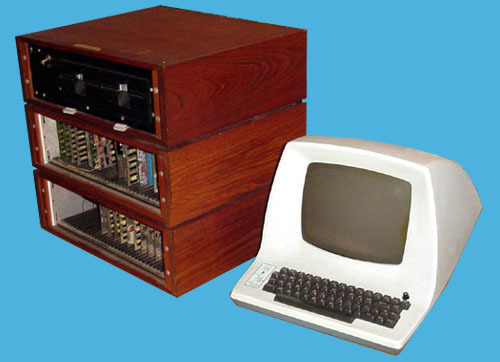 The instrument consisted of a large filing-cabinet sized wooden box for all of the computer peripherals – hard drives, cables and so-on, two detachable 61 note keyboard plus a control panel consisting of numerous coloured lights and a video monitor. 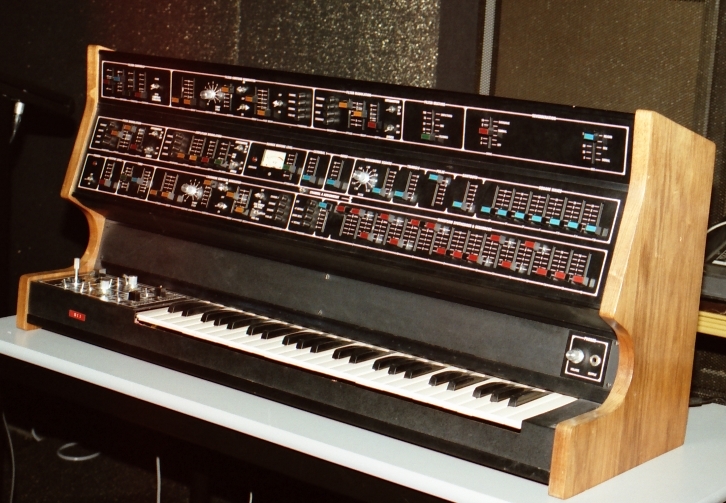 The ADS100 was completely hand wired and took over seven months to build only one is known to have been sold – for $30,000 to film composer David Campell, (Beck’s father, who also arranged music for Tori Amos, Elton John, The Rolling Stones, Kiss, Aerosmith) and later acquired by musician and vintage synthesiser collector Brian Kehew. 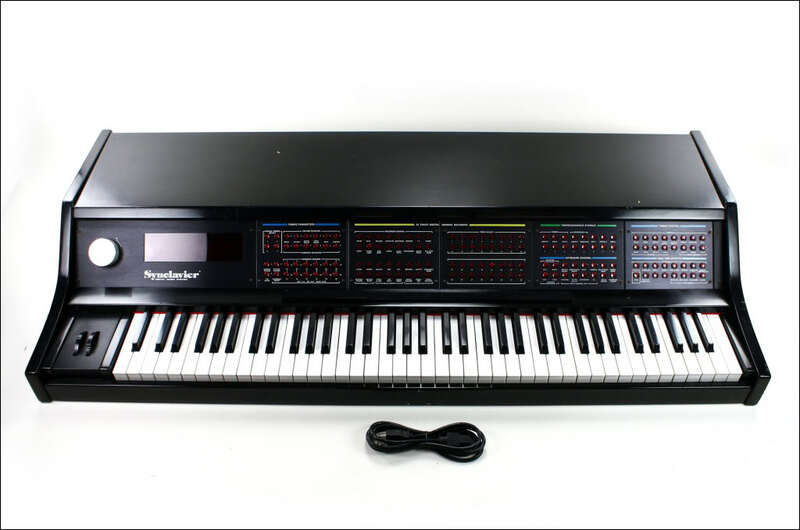 1982 saw the release of the 200-R which featured a a 16-track polyphonic sequencer with 80,000 note storage capability editable from the video display. This version was priced at $25,000. Only one was ever built. 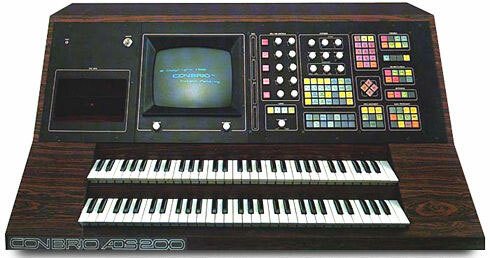 Like many other High-end, expensive digital synthesisers, the days of the ConBrio ADS were numbered with the arrival of cheaper and available technology – specifically the Yamaha DX7 FM synthesiser (1983) – as well as affordable personal computers running sequencer applications such as Steinberg’s Cubase. After Con Brio’s demise, Danziger and Lieberman have become successful manufacturing semiconductors. Tim Ryan cofounded The Sonus corporation, which later became M-Audio, a leading manufacturer of computer audio interfaces, MIDI controller keyboards, and studio monitor speakers.